Anthony Joshua did what he had to knocking off hopeless Eric Molina in third round to retain his IBF heavyweight title. Less we write about the fight the better it was disgrace but thankfully the best part came after the fight when Eddie Hearns confirmed Joshua vs Klitschko in April 2017. Eric Molina hardly threw a punch and he was in a ducking mode from the word go. Joshua found it hard to breakdown Molina in the opening two rounds but he exploded in at the start of round three and knocked down Molina with a powerful right. Molina beat the count and got up only to find another flurry of punches forcing him on the ropes helpless and referee stepped in to stop the fight. However as bad the as the fight was on the night, boxing fans finally heard the news of confirmation Joshua vs Wladimir Klitschko set to take place in April 2017. Anthony Joshua is set to take on American heavyweight boxer Eric Molina in the IBF heavyweight title fight which will headline the Sky Box Office PPV on Saturday night, 10th December 2016. This is surely the penultimate fight for Joshua before he finally fight someone top ranked likely to be either Klitschko or Deontay Wilder next year. The build up to this main-event has been overshadowed by co-feature fight between Whyte and Chisora but in Eric Molina, Joshua is fighting someone who can cause all sorts of troubles for the Brit. Joshua and Klitschko fight is already in the pipeline as far as the British media is concerned and a April 2017 date is muted what will be unification heavyweight bout at Wembley in London. 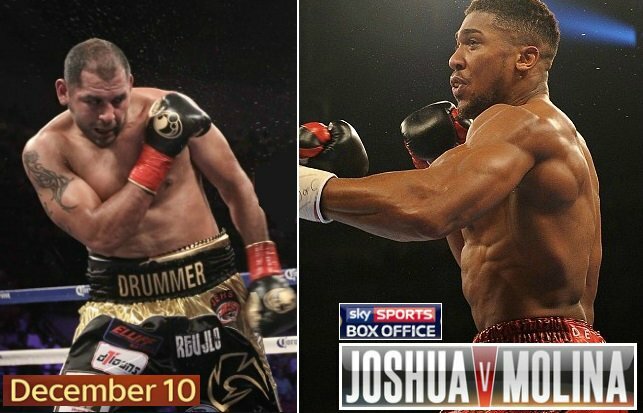 However Joshua can not afford to slip up against Eric Molina or his career might take a nose dive from here. He is odds on favourite to get a knockout/convincing victory on Saturday night in Manchester and that will pretty much be a tune up fight. Joshua is widely regarded as the top heavyweight fighter world wide and although he is in the early days of his career he has put himself right up there at the top. A win on Saturday against Molina will also give us a chance to asses how he compares with Deontay Wilder who defeated Molina in 5th round knockout. Official Weigh-ins: Joshua came in good shape for the official weighins on friday night. He is taller and heavier compared to Molina so age and size advantage already falls for Joshua he weighed at 17st 11lbs 1oz compared to Molina who hit the scale at 16st 13lbs 8oz. If you missed the live action of the fight, you can always tune in here as we will be placing extended replay footage of the fight right here immediately after the fight is over. If the fights goes beyond first 5 rounds we will have the highlights of entire fight couple of hours after its all done and dusted.